Nita Strauss (born on December 7, 1986) started her guitar career at the age of 13; she is not a guitarist that provision of formal education. 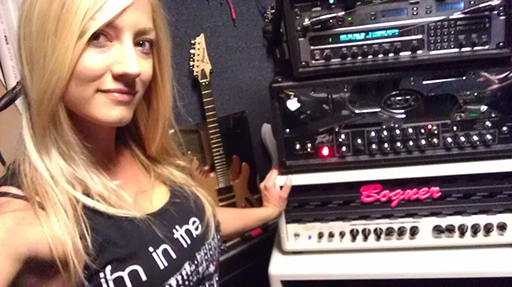 but the guitar skills have allowed her to play shows in the US, UK, Europe, Asia, South America, Africa, the Caribbean, and get support from Boss Corporation, Ibanez, Affliction, DiMarzio, GHS/Rocktron, Dunlop Manufacturing, Roland Corporation, Line 6, Bogner Amplification, Korg and more. Nita has appeared in many worldwide advertising, print ads and dozens of albums, trailers, and soundtrack. the latest is Heroes of the Storm computer game (Blizzard Entertainment) and a Grammy nomination Metal Gear Rising: Revengeance (Konami / Platinum Games), and columnist Premier Guitar “Drop Dead Shred” .She was ranked # 1 in Guitar World ‘list “10FemaleGuitarPlayersYouShouldKnow”, and has been featured in the issue of Revolver’s annual “Hottest Chicks in Hard Rock” and calendars for the last 2 years. Strauss became a member of the tour As Blood Runs Black who play in Europe in 2009 and then in world famous Bamboozle West at Angel Stadium in Anaheim, CA in 2010. in 2010 Nita Strauss directly elected to join the band members Jermaine Jackson and Michael Jackson’s for a series of special performances stadiums in Africa. In 2011 Strauss was invited as a guest performer with The Iron Maidens, then Nita Strauss became a member of the band as well. As a member of the Maidens, stage name is “Mega Murray”, a female version of Iron Maiden guitarist Dave Murray. Strauss worked with Courtney Cox, also known as “Adriana Smith”, a female version of Iron Maiden guitarist Adrian Smith. In 2013 Strauss was invited to join together Femme Fatale Courtney Cox. This year also, Strauss became a member of Critical Hit Band, which was founded by Jason Hayes (World of Warcraft composer) and “Piano Squall” aka Michael Gluck, to make arrangements of video game music. Nita Strauss also contracted as the official in-house guitarist for the Los Angeles Kiss arena football team, owned by Gene Simmons and Paul Stanley of Kiss.